Complements The Legal Research Dictionary: from Advance Sheets to Pocket Parts and Legal Research Q&A: 401 Flashcards with Companion Looseleaf. 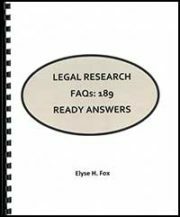 189 questions and answers that provide an excellent introduction and overview of the law, legal research, legal research tools, and legal bibliography. Purchased by law libraries and law libraries around the world. Full description below. 1 copy: $50; 2 copies: $95; 3 copies: $135; 4 copies: $170; 5 copies: $200. 8 1/2 x 11. 94 pages. ISBN 978-0-941991-50-4. Author: Elyse Fox, BA, JD, MSLS. Ms. Fox has worked as a law librarian for 30+ years. She writes frequently on legal research and law library management. Previously she practiced law in Chicago and Boston. She also taught legal research to law students and practicing attorneys..